The Palazzo Reale, or Reggia, at Caserta is Italy's answer to Versailles. This massive palace and park was built by Luigi Vanvitelli for Charles III Bourbon from 1752 to 1774, drawing inspiration from the Buen Retiro in Madrid and Versailles itself. Vanvitelli kept most of the opulence inside and in the vast park out back, leaving the 815-foot-long facade rather simple, even austere (leading writers like Stendhal and Dumas to compared it to a barracks). 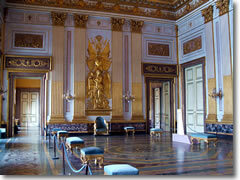 The gilded Sala del Trono (Throne Room) in the 19th century Apartamento Nuovo del Re in the Palace of Caserta. (Photo by Twice35 & Renina25)It has has its shining political moments, perhaps the greatest of which was then the German troops in Italy surrendered to the Allies in 1945—the first German surrender that signaled the beginning of the end of World War II. Since 1996, it has been a UNESCO World Heritage Site, and served as the sumptuous set for several movies (see the box below). 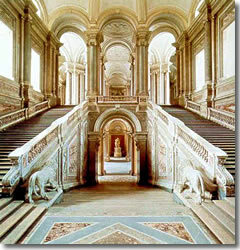 The grand staircase.Of the 1,200 rooms of the interior, fewer than half are open to the public as a museum. The highlights include the sumptuous 18th-century Royal Apartments and the cavernous 19th-century Throne Room pictured above (the decorations honor every Naples monarch from Roger the Norman through Ferdinand II—save for the Napleonic occupiers Joseph Bonaparte and Joachim Murat). The palace of Caserta was tapped by George Lucas to serve as the non-CGI version of Queen Amidala's royal palace on Naboo in Star Wars: Episode I (Phantom Menace) and Star Wars: Episode II (Attack of the Clones); parts of latter were also filmed on Lake Como. It has also recently stood in for Vatican interior and courtyards in the films Angels & Demons and Mission Impossible III.There's a small art gallery of royal portraits, and the elegant Court Theater, with a stage backdrop that can be removed so that the gardens outside become the scenery. Vanvitelli also designed a park to rival that of Versailles, centered on a long axis of pools and fountains that run from the back of the Reggia for some 3km (2 miles) to end in the Grande Cascata, or Great Waterfall, 250 vertical feet of splashing water and allegorical statuary. 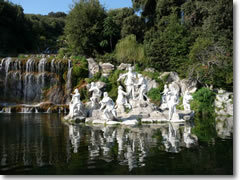 A sculptural group of Diana and her huntresses in the Caserta park. (Photo by Marcok)A minibus makes the jaunt out to the Grande Cascata if the palace has worn out your legs; a path leads up the side of the cascata to the top, where you can drink in a great vista of the park and palace beyond. There's also a CTP bus (tel. 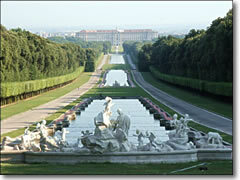 +39-081-700-1111) from Naples' Piazza Garibaldi to Caserta every 20 min (1 hr.). The Royal Apartments are closed on Tuesday. The park is open daily until two hours before sunset (which can be as early as 2:30pm in December, increasing to as late as 6pm June to August). There's a provincial tourist info office in the Reggia itself (tel. +39-0823-322-233).